Powers and Abilities: Super strength, durability, endurance, speed and agility, enhanced senses, flight and levitation, magic, can change to Dragon Form, ki/energy sense and manipulation, elemental manipulation (at least lightning, fire and ice), teleportation, memory reading, energy blast, immortality, her Dragon Form is made of fire. She is the current Dragon Lord and is considered the most powerful dragon in the world. Her dragon form is that of a crimson fire dragon; she can use a multitude of high level spells such as long distance teleportation. She keeps Sidgar in check when his temper gets the better of him. In her human form she takes the form of a young girl and likes to walk and talk with humans, especially Id when she meets him. Even though she is friendly to all her personality is shown to wise, decisive, and thinks of the bigger picture during situations as during a major battle she intentionally allowed Id to defeat most of them to see his abilities first hand. Only when she was pushed too far by a person who was a fragment of Chaos did she show her fierce instinct for battle. 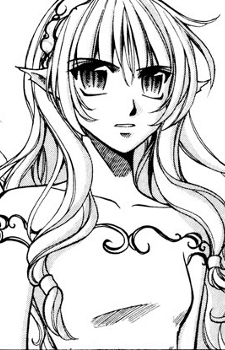 In Chapter 151 of the manga, the Council of Patriarchs strip of her title due to her blasphemy. It is also in this same chapter we find out that she saved Lailo Sidgar when he was a child from the extermination of the Gold Dragons due to the actions of Greydrone, the previous Dragon Lord and a Gold Dragon. She idolizes Greydrone whom other dragons have labeled traitorous to God. She meets Id and Irlina through Lailo when Id seeks Selenia to give her a message from Greydrone, and he also tells her about Lailo destroying the Sphere of Seals and his inaction of assisting Irlina's village. She orders Lailo to go to the village with them in order to resolve the issue. She often acts as an arbitrator for Id and Lailo when they are at odds. She accompanies Id and Irlina for a short while until they confront two of the six fragments of chaos, Kukuro and Chaos. She battles Kukuro but is easily defeated by him.